A small cohort of students marched from Trinity to the Department of Education calling for investment in third-level education. Students gathered this afternoon in Front Square calling on the government to invest more money in higher education, with walkouts taking place on campuses all over the country as part of the Union of Students in Ireland’s (USI) Fund the Future campaign. Around 200 students the country travelled for the beginning of the rally in Trinity, though the crowd thinned to around 40 once it moved outside Front Gate. USI’s delegation was led by Colm O’Halloran, the union’s Vice-President for the Dublin Region. USI President Síona Cahill was not present, having visited Dublin City University (DCU) to participate in localised action there as part of the campaign. Speaking to The University Times, O’Halloran said that the Fund the Future campaign consists of “local actions happening on each campus”. O’Halloran said USI’s officers “are spread throughout campuses, all of last week and today as well, assisting students’ unions on the ground with their own actions”. Actions took place this afternoon in every USI-affiliated college as part of the campaign. President of Trinity College Dublin Students’ Union (TCDSU) Shane de Ris told The University Times that students were rallying to “demand action”. The government, he said, is “neglecting” higher education. Speaking to The University Times, Laura Beston, the President-elect of Trinity College Dublin Students’ Union (TCDSU) Laura Beston said that government cuts “affect people from lower backgrounds”. “We need more support to go into third-level institutions”, she said. University College Dublin Students’ Union (UCDSU) was also in attendance at the rally. Speaking to The University Times, UCDSU President Barry Murphy said that it was “really important that secondary students and university students across Ireland today make their voices heard, to tell our government that they really need to invest in education for our future generations”. Before Profit – said People Before Profit is “skeptical” of the campaign’s approach. The statement said there “must be a marked change in tactics from USI and student unions if the campaign is to be successful”. Members of trade unions were also present at the march. Speaking to The University Times, Karl Byrne, the organiser for the education sector of SIPTU, said that “the biggest cuts in the austerity years were placed on higher education”. “We have a situation”, he said, “where there’s more students coming in, students are being asked to pay more in terms of the type of education that they’re having to get, and the quality of the education is under threat, because there isn’t enough money in the system”. 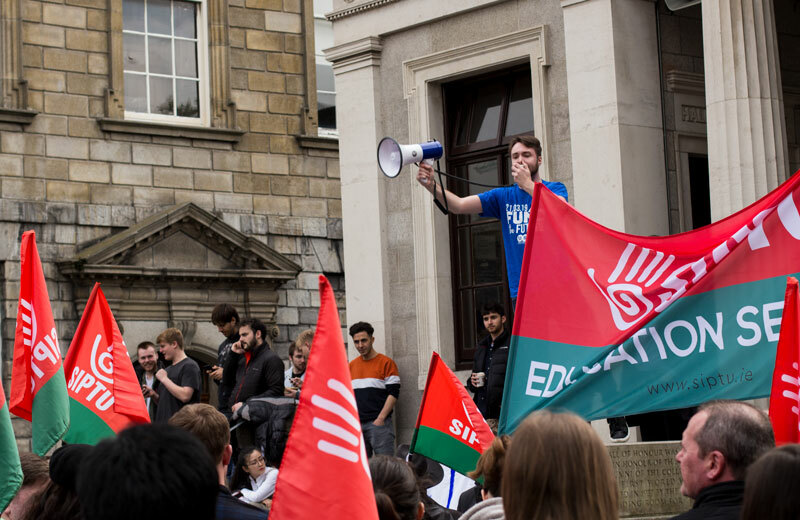 Recently, the presidents of all Irish third-level students’ unions joined the USI to voice their concerns about the funding crisis in an open letter, which was published in the Irish Times. The letter called for increased funding to third-level institutions, an end to the free fees scheme and an increase in affordable student accommodation. The letter was critical of the lack of government investment in education and called the proposal to introduce student loans “wholly unacceptable”. Students’ union heads also attacked the lack of government action following the publication of the Cassells report, a document drawn up by a government-appointed research group that recommended sweeping reforms to the funding of third-level institutions. One of three proposals put forward by the Cassells report included the introduction of income-contingent student loans. Students have for years been calling on the government to increase spending on higher education. Late last year, the Irish Universities Association (IUA), the lobbying body for Ireland’s seven universities, launched the Save Our Spark campaign, warning that further inaction could cause a fall in the number of college places for future students. The government’s budget in 2019 disappointed many in the sector, with €150 million allocated for research, higher and further education and just €57 million going towards higher education. This is significantly less than the €600 million a year recommended by the Cassells report in 2016.